Architects of the mid- to late-twentieth century often criticized the architecture of the early twentieth century for its timidity, a deficiency that they believed to be evident from that earlier era's slavish reproductions of historical forms.1 Such criticisms, however, fail to acknowledge the seriousness with which American architects and thinkers from the late-nineteenth and early-twentieth centuries treated their roles as the newly appointed guardians of millennia of European civilization. Architects and planners who were inspired by this notion saw no apparent conflict between the use of archaeologically accurate architectural forms and the creation of an architecture that was essentially modern. The intersection of visions of American empire, neoclassical architectural form, and modern architectural theory is especially evident from an examination of the group of institutional buildings assembled on Audubon Terrace in Washington Heights in New York City. As the first building to be constructed on this campus, and the one that established the architectural idiom that all subsequent buildings would follow, the Hispanic Society of America building (1908) presents the ripest opportunity for a close study of these themes. Created through the munificence of Hispanic Society founder Archer Milton Huntington, and designed by Archer's cousin, Beaux-Arts-trained architect Charles Pratt Huntington, this building embodies the spirit of its age in its impeccable neoclassical form and its function as a showcase for the accomplishments of a once-great European civilization. European in subject matter, it nonetheless fits into a milieu that is consummately American. Before addressing these themes, it is necessary to first understand the conditions that gave rise to American imperialist optimism around the turn of the twentieth century. Appropriately enough for a discussion of the building of the Hispanic Society, this is a story that begins with Spain. 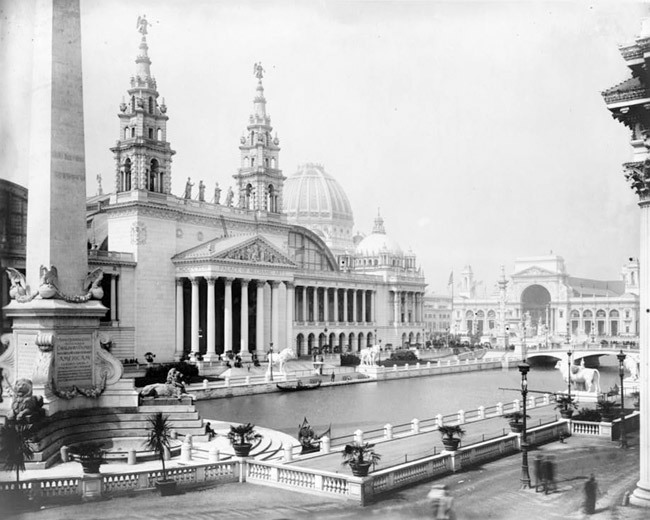 World's Columbian Exposition, Chicago: Palace of Mechanic Arts and Lagoon, 1892. Library of Congress. American architects had much to overcome in realizing their vision of an "American Renaissance," as one of the sub-styles to emerge from this period has been labeled. American individualism and capitalist disdain for government intervention had resulted in the development of cities that were decidedly haphazard, a state of affairs that was anathema to classically inspired notions of order and compositional harmony. These perceived deficiencies in American cities were especially glaring when compared with grandly planned and tightly regulated European city plans like those in Paris and Vienna.7 Unable to assume the sort of dictatorial power that had made massive urban interventions possible in those places, American architects' initial attempt at large scale, Neoclassical urban planning had to take place in the fantasy realm of the World's Columbian Exposition of 1893 in Chicago. With a master plan by Daniel Burnham, and a host of buildings designed by some of the most illustrious architects working in America at the time, the fairgrounds featured the unity of design, grand vistas, and tightly controlled visitor experience to which the Beaux-Arts-inspired architects aspired. New York City improvement commission plan, 1907. Columbia University. New York Public Library, Fifth Avenue at East 42nd Street, 8x10 inch dry plate glass negative, Detroit Publishing Co.
Birdseye view of projected Columbia University Campus, McKim Mead & White, 1903, New-York Historical Society. It can be difficult to assess the success of Beaux-Arts-inspired "City Beautiful" thinking in New York City. On the one hand, comprehensive redevelopment schemes like that proposed in 1907 were never realized in their entirety, and to this day the grid remains the dominant organizational scheme for the layout of Manhattan.10 On the other hand, the zoning regulations passed in 1916 did enshrine some City Beautiful principles into law. Furthermore, at the level of individual buildings and specific sites, New York is replete with examples of Beaux-Arts civic architecture from the turn of the twentieth century. One realm in which this mode of thinking enjoyed unmitigated success is the institutional. Many structures were built during this period to house private, semi-private, or fully public organizations that were devoted to the enrichment of the public realm. 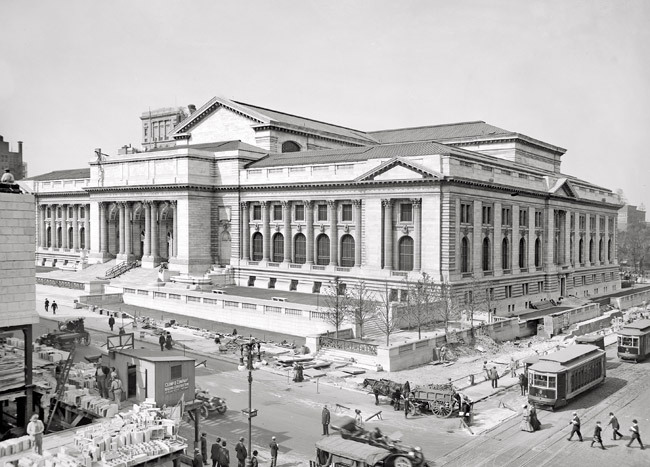 The list of such buildings includes the Brooklyn Institute of Arts and Sciences (1895-1915, now the Brooklyn Museum), the Metropolitan Museum of Art (1895-1902), the New York Public Library (1897-1911), and the Morgan Library (1902-1907). The collection of institutional buildings on Audubon Terrace has been described as "perhaps the grandest attempt to synthesize the artistic and philosophical goals of the American Renaissance. "12 The term "American Renaissance" is used here to distinguish the ensemble's style from other Beaux-Arts projects that hewed more closely to the "Modern French" style.13 While "Modern French" buildings reveled in a profusion of cartouches, mansards, and other elements thought to be typical of turn-of-the-century French architecture, the buildings at Audubon Terrace are wrought in a more austere neo-Italian Renaissance style that is essentially archaeological in inspiration. Although one might argue with the distinction in the quotation above between "artistic" and "philosophical" goals in the context of an artistic movement that was so philosophical—or vice versa—this might be taken to mean that the buildings of Audubon Terrace faithfully observe the principles of Beaux-Arts planning and composition while at the same time fulfilling the broad social purpose of educating and enlightening the general public. The unity of the buildings at Audubon Terrace is reflected not only in the unity of purpose as it relates to public education, but also in a general thematic unity that could be described simply as "civilization." This complex provided a single location in which one could study and admire the accomplishments of a once-powerful empire of the Old World (the Hispanic Society); the artistry of the money used by a variety of world civilizations (the American Numismatic Society); current thinking and efforts on how best to document and describe the full extent of the globe (the American Geographical Society); the culture of "primitive" peoples whose "disappearance" was thought a necessary, if tragic, side effect of the march of civilization (the Museum of the American Indian); and the works of the nation's finest artists (the American Academy of Arts and Letters and the National Institute of Arts and Letters). In this thematic unity we may discover the personal interests of Archer Milton Huntington, the wealthy patron who brought these institutions together on Audubon Terrace. More broadly, however, it may be read as the preoccupations of an entire nation poised to assume its role as a civilization for the ages. Buildings and terraces of the Hispanic Society, ca. 1950. HSA. The modernity of the Hispanic Society building carries through to its interior, in which Beaux-Arts principles are once again employed to draw the visitor through the space and into the main hall. With the building's participation in contemporary American zeitgeist having been established by the building's exterior, in this space the architect was free to use "a lighter style," and sought to recreate a Spanish courtyard with a terra-cotta arcade displaying the coats-of-arms of Spanish cities and provinces.20 Critics visiting the Society at the time of its opening were suitably impressed by the many clever details that had been employed to display the collections, such as the glass display cases that could be illuminated with electric light at the touch of a button, and the "swinging doors superimposed on swinging doors" that were used to display maps, charts, prints, and drawings.21 While some critics may have taken issue with the dissonance between the building's exterior and its subject matter, none thought to quibble with the use of electric lights in an Italian Renaissance building, once again implying that there was nothing inconsistent about a modern building with a neoclassical treatment. This brief paper is not meant to suggest that the Hispanic Society building should be understood as a stepping-stone toward a more "pure" architectural modernism that was only realized later in the twentieth century. Tempting as it may be to write that this building is modern "in spite of" its neoclassical form, it is in fact more accurate to say that it is modern because of a neoclassical form, a form that partook of a historical moment in which Americans felt closer than ever before—and perhaps ever since—to European civilizations at their moments of greatest achievement. American architects working in this idiom did not wish to derive architectural forms entirely different from the established European forms because they did not wish to establish a civilization entirely different from that of Europe. This respect for the Old World is evident both from the architecture and from the stated purpose of the Hispanic Society building. 1 Walter Gropius wrote, "We have had enough and to spare of the arbitrary reproduction of historic styles." The New Architecture and the Bauhaus (Cambridge, Mass. : The M.I.T. Press, 1965), 44. These attitudes filtered down to less elite architectural circles as well: Under assault for their 1964 "modernization" of the 1912 Black, Starr & Frost building designed by Carrère & Hastings, architects Alvin Hausman and Stanley Rosenberg wrote in a letter to the editor, "We commend The Times's effort to save historic buildings, but let us bend ourselves to the task of preserving indigenous American architecture, not those imitations of a European society." "Building Held Outmoded," Letter to the Editor, New York Times, Feb. 8, 1964, 22. 2 Donald L. Shaw, The Generation of 1898 in Spain (London & Tonbridge: Ernest Benn Limited; New York: Barnes and Noble Books, 1975), 1-2. 3 In the immediate aftermath of the war, Colonel A. K. McClure of Philadelphia remarked on the new role for the United States: "Call it imperialism if you will; but it is not the imperialism that is inspired by the lust of conquest. It is the higher and nobler imperialism … Such is the imperialism that has become interwoven with the destiny of our great free Government, and it … will command the commendation of the enlightened powers of the Old World, as it rears, for the guidance of all, the grandest monuments of freedom as the proclaimed policy and purpose of the noblest Government ever reared by a man or blessed by Heaven." "The Higher Imperialism," The New York Times, Aug. 11, 1898, 5. 4 Robert A.M. Stern, Gregory Gilmartin, and John Montague Massengale, New York 1900: Metropolitan Architecture and Urbanism 1890-1915 (New York: Rizzoli International Publications, Inc., 1983), 21. In preparation for the design of the Hispanic Society building, architect Charles P. Huntington spent seven weeks in Spain "to study its architects and obtain material for his designs." "Hispanic Society's Museum," Real Estate Record and Guide 74 (November 26, 1904), 1151. 5 David Garrard Lowe, Beaux Arts New York (New York: Whitney Library of Design, an Imprint of Watson-Guptill Publications, 1998), 11-17. 6 Andrew S. Dolkart, "The Architecture and Development of New York City: The Public Realm," The Architecture and Development of New York City website. http://nycarchitecture.columbia.edu/0244_3/0244_3_fulltext.pdf . Accessed 5 June 2012. 7 Stern, New York 1900, 27. 11 Barry Bergdoll, "The Genesis and Legacy of McKim, Mean & White's Master Plan for Columbia University," Mastering McKim's Plan: Columbia University's First Century on Morningside Heights (New York: Miriam and Ira D. Wallach Art Gallery, Columbia University in the City of New York, 1997), 40-49. 12 Stern, New York 1900, 105. 14 Dolkart, "The Architecture and Development of New York City." 15 New York City Landmarks Preservation Commission, Audubon Terrace Historic District Designation Report, Designated January 9, 1979, 1-2. 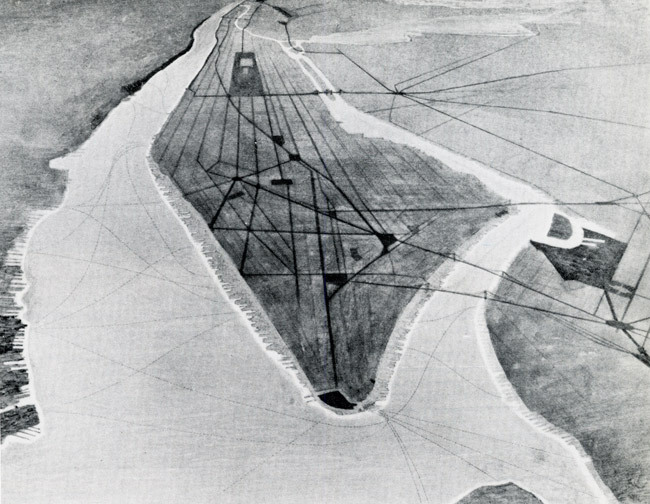 17 Anthony Vidler, Claude-Nicolas Ledoux: Architecture and Social Reform at the End of the Ancien Régime (Cambridge, Mass., and London, England: The M.I.T. Press, 1990), ix. 20 Charles P. Huntington, "Architectural Criticism," 35. 21 C. Lewis Hind, "A New Museum of Treasures—The Hispanic Society of America," International Studio 34, (No. 135, May 1908), 104. Bergdoll, Barry. 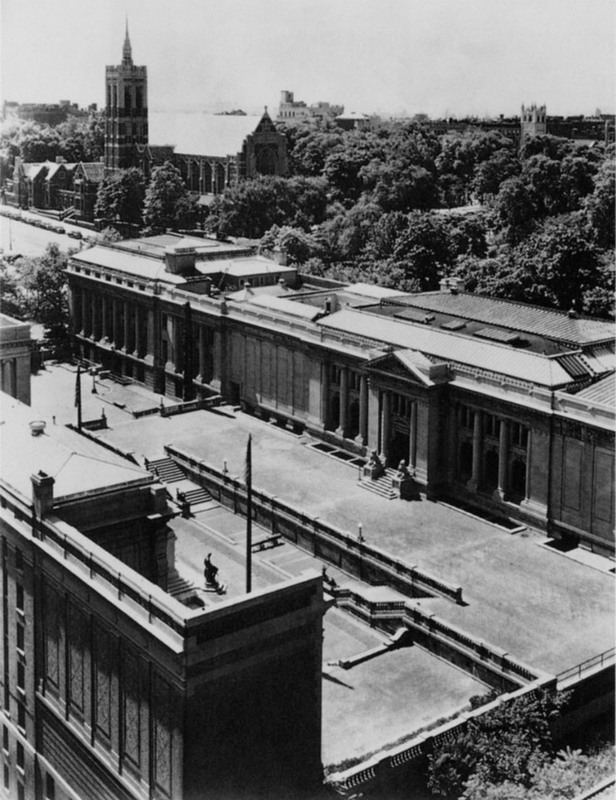 "The Genesis and Legacy of McKim, Mean & White's Master Plan for Columbia University." Mastering McKim's Plan: Columbia University's First Century on Morningside Heights. New York: Miriam and Ira D. Wallach Art Gallery, Columbia University in the City of New York, 1997. Dolkart, Andrew S. "The Architecture and Development of New York City: The Public Realm," The Architecture and Development of New York City website. http://nycarchitecture.columbia.edu/0244_3/0244_3_fulltext.pdf . Accessed 5 June 2012. Gropius, Walter. The New Architecture and the Bauhaus. Cambridge, Mass. : The M.I.T. Press, 1965). Hausman, Alvin, and Stanley Rosenberg. "Building Held Outmoded." Letter to the Editor, New York Times, Feb. 8, 1964. 22. "The Higher Imperialism." The New York Times, Aug. 11, 1898, 5. Hind, C. Lewis. "A New Museum of Treasures—The Hispanic Society of America," International Studio 34, (No. 135, May 1908), 99-104. "Hispanic Society's Museum," Real Estate Record and Guide 74 (November 26, 1904), 1151. Hitchcock, Henry-Russell, and Philip Johnson. The International Style. New York: W.W. Norton & Company, Inc., 1966. Huntington, Charles P. Huntington, "Architectural Criticism," Architecture 19 (March 15, 1909), 34-35. Lowe, David Garrard. Beaux Arts New York. New York: Whitney Library of Design, an Imprint of Watson-Guptill Publications, 1998. New York City Landmarks Preservation Commission, Audubon Terrace Historic District Designation Report, Designated January 9, 1979, 1-2. Shaw, Donald L. The Generation of 1898 in Spain. London & Tonbridge: Ernest Benn Limited; New York: Barnes and Noble Books, 1975. Stern, Robert A.M., Gregory Gilmartin, and John Montague Massengale. New York 1900: Metropolitan Architecture and Urbanism 1890-1915. New York: Rizzoli International Publications, Inc., 1983. Vidler, Anthony. Claude-Nicolas Ledoux: Architecture and Social Reform at the End of the Ancien Régime. Cambridge, Mass., and London, England: The M.I.T. Press, 1990.